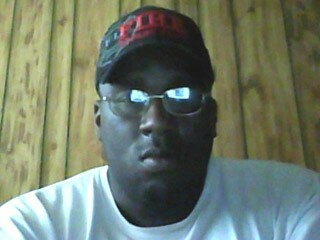 The dilemma of slavery continues to dog the United States of America (USA) 137 years after Pres. Abraham Lincoln signed the Emancipation Proclamation (1862) freeing only the slaves held in the South. Many historians say emancipation caused more problems than it solved. 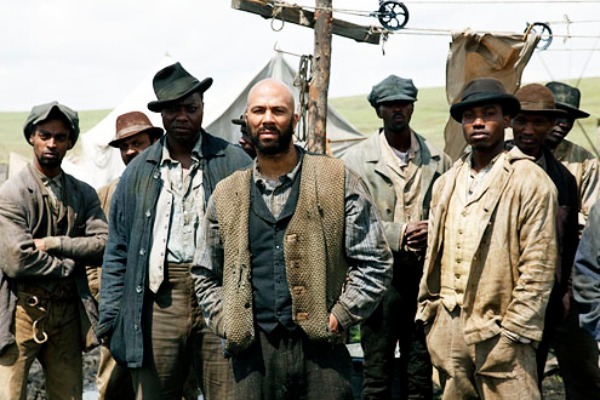 These learned scholars opine that the Civil War was unnecessary because slave masters would have ended slavery because they would have realized supporting slaves was too great an economic burden and that free labor was more productive. However, slavery was about more than economics and productivity. Slavery was the base of a value system that defined the Southern way of life. It was tied to a Southerner’s sense of personal worth and upon which the house of cards of the Confederacy was built. For the Southern gentry, it was not simply a question of freeing or not freeing slaves. The proposition was intimately related to a society’s unwillingness to accept as human property it was taught to see as brut animals one owns like a horse or cow. Slavery’s belief system attributed everything good/righteous to white people and everything bad/evil to blacks. Synonymous to the mind-set of English lords, families that owned slaves were bred to believe in their inherent right to be masters just as they bred into slaves the rightness of being owned. People who believed in that system could never accept that the stroke of a pen could rob them of an entitlement to which whites clung so tenaciously for generations and sacrificed tens of thousands of lives to preserve. The reality is Lincoln’s signature did not undo the mental underpinning that justified slavery and the dehumanizing process of white supremacy that was supported by the socioeconomic, educational, religious and political systems in the US. Incidents such as those that occurred in North and South Carolina recently are endemic to the 15 slave states and find their geneses in the forlorn hope of returning to that erst while existence before emancipation. That hope is nurtured by Article I Section II of the US Constitution and state practices and policies that give rise to unresolved psychological issues left over from slavery. These types of gruesome “hate crimes” continue to occur from Texas to West Virginia. Such murders are not the result of wanton violence because the perpetrators are always white men and the victims black. They are reminiscent of ritualistic lynchings that were so popular from the 1890s through the 1940s. They seem to be a result of latent or repressed rage that surfaces uncontrollably when a black man is perceived as challenging the master’s status. The aforementioned historians would readily reject this hypothesis but when people who have been immersed in the use of dehumanizing hatred which is tied to their sense of worth and power lose status to those that are dehumanized, the affect can be intolerable. Under such circumstances totally despicable acts can result. The next example relates to children. Breeding slaves meant offsprings were notA 150-year-old photograph discovered in an attic in North Carolinarevived haunting images of the faces of American slavery. 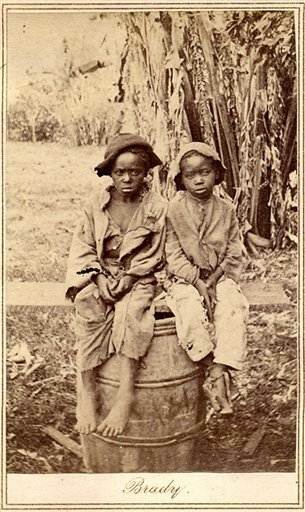 The picture shows two young black barefoot slaves, wearing ragged clothes, perched on a barrel. The photo, which may have been taken in the early 1860s, is believed to be of a boy named John and an unidentified companion. Will Stapp, a photographic historian and curator for the National Portrait Gallery at the Smithsonian Institution said the picture is “A testament to a dark part of American history. What you are looking at when you see this photo are two boys who were victims of that history.” Found during a moving sale in Charlotte in April, the photo was accompanied by a document detailing the sale of John in 1854 for $1,150. Stapp said the photo was probably taken by Timothy O’Sullivan, an apprentice of Mathew Brady, the famous 19th-century photographer whose portraits of historical figures such as Pres. Abraham Lincoln are legendary. O’Sullivan photographed what is believed to be some of the first slaves liberated after Lincoln issued his preliminary Emancipation Proclamation (1862). Newsom’s conclusions are drawn from research and statistics that show, while peer research institutions have documented plans to retain and advance minority faculty, the outcomes reflect nothing more than lip service. “If you are an African-American, American Indian or Latino with a Ph.D., your odds of ever receiving tenure at a Research I (school) are between slim and none.” Between 2001 and 2007, black professors consistently represented just 3 percent or less of tenured or tenure-track faculty year after year at Harvard University, Ohio State University, University of Florida, University of California at Los Angeles and Berkeley, University of Illinois, University of Texas, Stanford University and the University of North Carolina, according to the National Center for Education Statistics. “It’s racial discrimination,” she said unapologetically. “We know what’s wrong; there is inherent bias in committees and negative perceptions based on race. “Institutional racism’ is just the door blocking entrance, once inside scholars find other superficial barriers for junior faculty, including overburdening service work, undervalued qualifications, and the lack of mentorship and support from senior faculty,” Newsom reiterated. Myths, misconceptions, deliberate distortion and outright lies taught about black people during slavery are still a part of white folklore regarding African Americans and continue to be taught. These socioeconomic, educational, religious and political processes serve the same purpose now they did during slavery; they are the base of an American value system that defined a way of life — white supremacy. This value system is no longer tied to just southerners’ sense of personal worth and power; it is as American as the “Tea Party Movement.” For a white man, there is no worst position or condition to be in than to be beneath a black man, because he is educated to see a black as totally worthless. The continuing dilemma of slavery is the shared value it holds for whites, so much so, they support each other as though status in the US is a zero sum game. The US Constitution still values slave descendants as 3/5 of white men. That is why the status of slave descendants can not be allowed to change. Whites are educated to believe they deserve a status above blacks and the failure to achieve it can trigger the kind of response displayed by the young man in South Carolina. White supremacy is a psychological disease left over from slavery that affects most white Americans and black people suffer its effects as institutional racism and acts of violence. The dragging of Hill’s body sheds light onto how much the death and destruction perpetrated upon African-Americans in this country hundreds of years ago still resides in this country’s DNA. How Ironic, two men, same name both killed, five years apart. How Ironic!